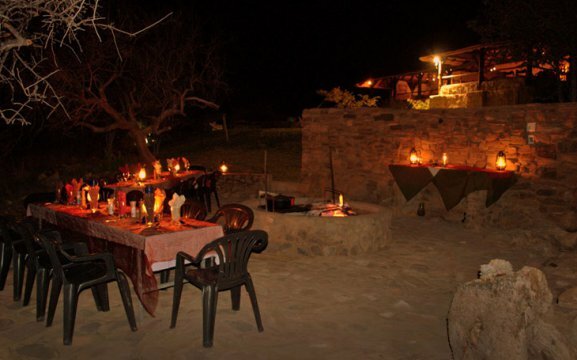 The Mondjila Safari Camp is situated 32km from the Etosha National Park’s Andersson’s Gate. It features a restaurant, bar and guest lounge at the main building. 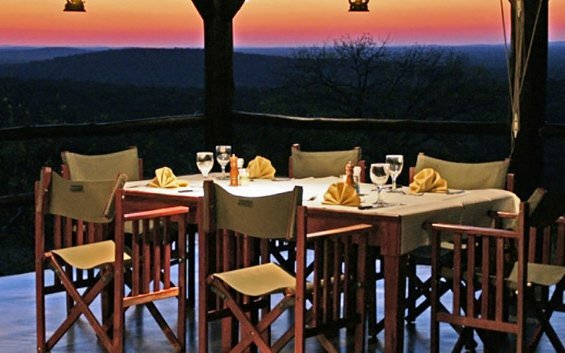 Outside you will find a spectacular open-fire pit and outside boma. Guests can buy their latest souvenirs and local artefacts at our curio shop. Mondjila means in Oshiwambo “to be on your way to somewhere/to be on the road”. 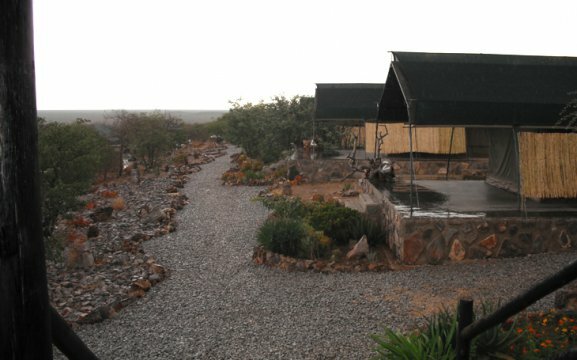 We cater for weddings, functions, team building or seminars held at our Camp. We have a wide range of delicious platters, refreshments from the bar and kitchen, lunch packs and breakfast packs, buffet dinners and also a bar facility. We can cater for up to 50 people. Mondjila has 11 luxury en-suite tents, raised on stone patchwork concrete bases. They all have their own light, braai area, power point and ablution block with hot and cold water. Inside is a standing fan for the hot summer nights and mosquito nets. Wood is also available at the reception. 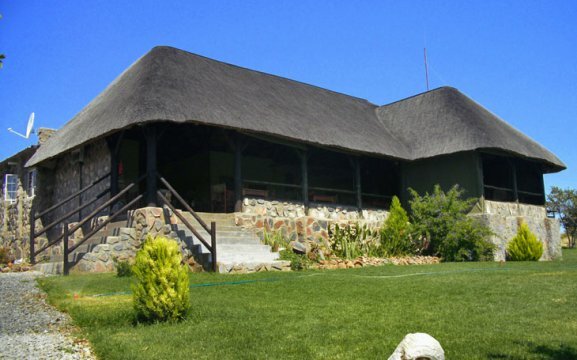 All campers can enjoy the swimming pool, bar facility and even a three course meal at our thatched dining area. 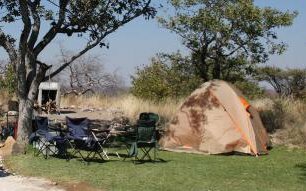 Each tent has its own spectacular view to nature. 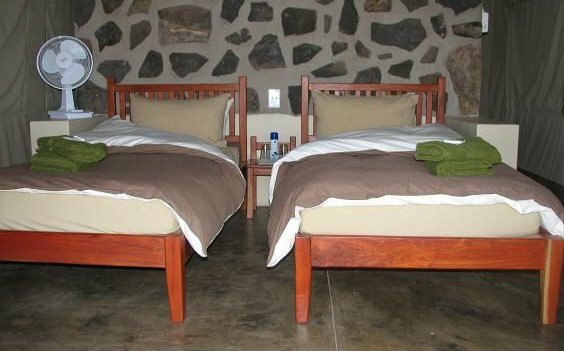 Our activities include a game drive through the Etosha National Park, bird watching, a tour around the working farm, hiking-trails or just relax at our swimming pool. The farm was founded in 1948 and is still in the family; here we farm with cattle and sheep. 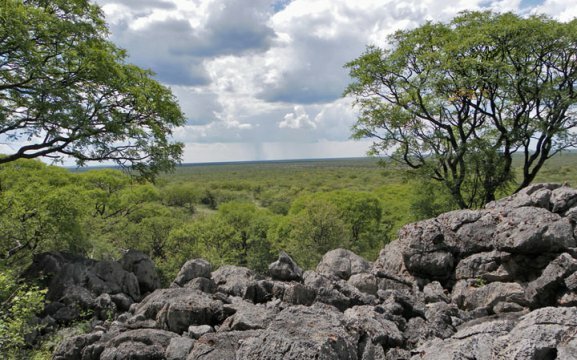 In the Etosha National Park you can find over 114 species of Namibian mammals, 340 bird species, 16 reptile and amphibians, catfish (seasonal) and a huge variety of insects. 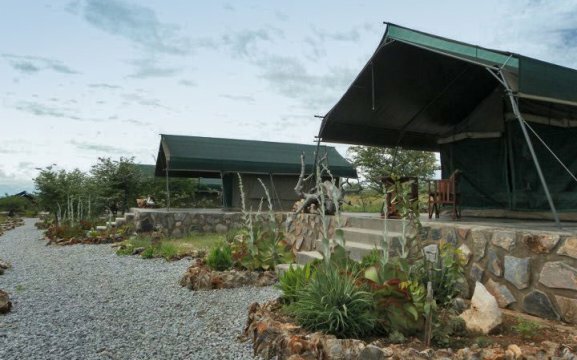 The wide selection of plains game include Burchell’s zebra, red hartebeest, giraffe, elephant, springbok, gemsbok, eland, kudu, roan and ostrich and even blue wildebeest. Predators like lion and hyena you will also find lurking not too far behind. 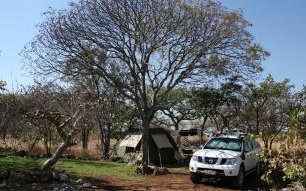 We offer full day game drives from sunrise to sunset with drinks and lunch packs, while the half day game drive is either from sunrise til lunch or from lunch til sunset, including drinks.